Saturday January 11th 1879 It was half past nine oclock when we got through breakfast and Mother and I had lots of work to do. I got the house all cleaned up, the lamps fixed and clothes ready to iron before dinner. In the afternoon I ironed, baked cake, washed out the new shirts besides helping about other work. Rob & Ott were out riding in the evening and stopped here with their company a while. Hatt & Win had been gone all day down to Downey on a visit. John Whetstone came over with Hatt after the train came in. A pleasant day. 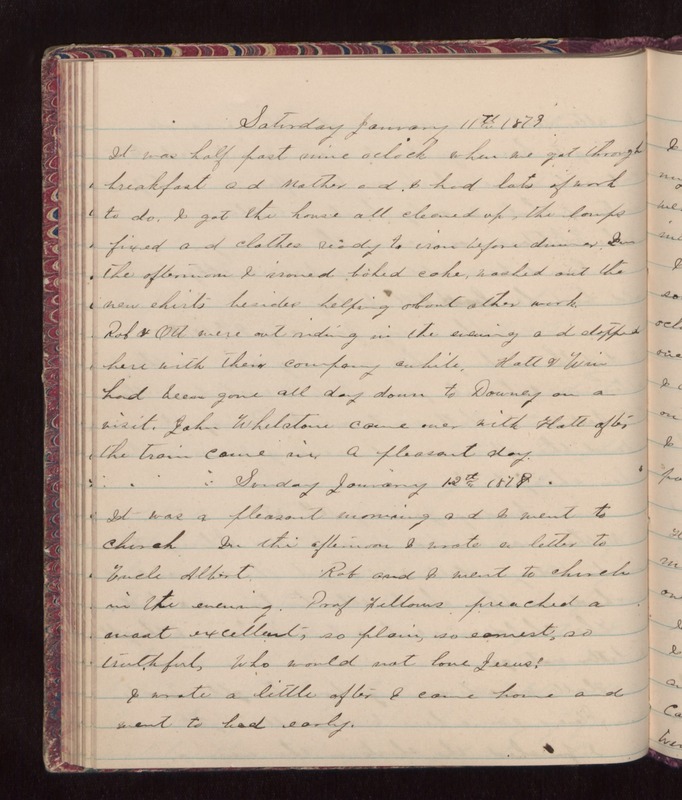 Sunday January 12th 1879 It was a pleasant morning and I went to church. In the afternoon I wrote a letter to Uncle Albert. Rob and I went to church in the evening. Prof Fellows preached a most excellent, so plain, so earnest, so truthful, Who would not love Jesus! I wrote a little after I came home and went to bed early.